For related races, see United States elections, 1944. The United States presidential election of 1944 was the 40th quadrennial presidential election, held on Tuesday, November 7, 1944. The election took place during World War II. Incumbent Democratic President Franklin D. Roosevelt defeated Republican Thomas E. Dewey. Roosevelt had become the first president to win a third term with his victory in the 1940 presidential election, and there was little doubt that he would seek a fourth term. Unlike in 1940, Roosevelt faced little opposition within his own party, and he easily won the presidential nomination of the 1944 Democratic National Convention. However, that convention dropped Vice President Henry A. Wallace as Roosevelt's running mate in favor of Senator Harry S. Truman of Missouri. Governor Dewey of New York emerged as the front-runner for the Republican nomination after his victory in the Wisconsin primary, and he defeated conservative Governor John W. Bricker at the 1944 Republican National Convention. As World War II was going well for the United States and its Allies, Roosevelt remained popular despite his long tenure. Dewey campaigned against the New Deal and for a smaller government, but was ultimately unsuccessful in convincing the country to change course. 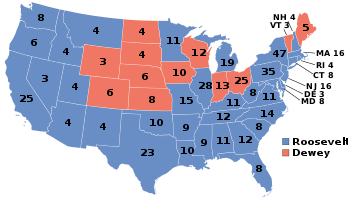 The election was closer than Roosevelt's other presidential campaigns, but Roosevelt still won by a comfortable margin in the popular vote and by a wide margin in the Electoral College. Rumors of Roosevelt's ill health, though somewhat dispelled by his vigorous campaigning, proved to be prescient; Roosevelt died less than three months into his fourth term and was succeeded by Truman. President Roosevelt was the popular, wartime incumbent and faced little formal opposition. Although many Southern Democrats mistrusted Roosevelt's racial policies, he brought enormous war activities to the region and the end of its marginal status was in sight. No major figure opposed Roosevelt publicly, and he was re-nominated easily when the Democratic Convention met in Chicago. Some pro-segregationist delegates tried to unite behind Virginia senator Harry F. Byrd, but he refused to campaign actively against Roosevelt, and did not get enough delegates to seriously threaten the President's chances. The obvious physical decline in the president's appearance, as well as rumors of secret health problems, led many delegates and party leaders to strongly oppose Vice President Henry A. Wallace for a second term. Opposition to Wallace came especially from Catholic leaders in big cities and labor unions. Wallace, who had been Roosevelt's vice president since January 1941, was regarded by most conservatives as being too left-wing and personally eccentric to be next in line for the presidency. He had performed so poorly as economic coordinator that Roosevelt had to remove him from that post. Numerous party leaders privately sent word to Roosevelt that they would fight Wallace's re-nomination as vice president and proposed instead Senator Harry S. Truman, a moderate from Missouri. Truman was highly visible as the chairman of a Senate wartime committee investigating fraud and inefficiency in the war program. Roosevelt, who personally liked Wallace and knew little about Truman, reluctantly agreed to accept Truman as his running mate to preserve party unity. Even so, many delegates on the left refused to abandon Wallace, and they cast their votes for him on the first ballot. However, enough large Northern, Midwestern, and Southern states supported Truman to give him victory on the second ballot. The fight over the vice presidential nomination proved to be consequential; Roosevelt died in April 1945, and Truman instead of Wallace became the nation's thirty-third President. As 1944 began, the frontrunners for the Republican nomination appeared to be Wendell Willkie, the party's 1940 nominee, Senator Robert A. Taft from Ohio, the leader of the party's conservatives, New York Governor Thomas E. Dewey, the leader of the party's moderate eastern establishment, General Douglas MacArthur, then serving as an Allied commander in the Pacific theater of the war, and former Minnesota Governor Harold Stassen, then serving as a U.S. naval officer in the Pacific. Taft surprised many by announcing that he was not a candidate as he wanted to remain in the Senate; instead, he voiced his support for a fellow conservative, Governor John W. Bricker of Ohio. With Taft out of the race some Republican conservatives favored General MacArthur. However, MacArthur's chances were limited by the fact that he was leading Allied forces against Japan, and thus could not campaign for the nomination. His supporters entered his name in the Wisconsin primary nonetheless. The Wisconsin primary proved to be the key contest, as Dewey won by a surprisingly wide margin. He took fourteen delegates to four for Harold Stassen, while MacArthur won the three remaining delegates. Willkie was shut out in the Wisconsin primary; he did not win a single delegate. His unexpectedly poor showing in Wisconsin forced him to withdraw as a candidate for the nomination. However, at the time of his sudden death in early October 1944, Willkie had endorsed neither Dewey nor Roosevelt. At the 1944 Republican National Convention in Chicago, Illinois, Dewey easily overcame Bricker and was nominated for president on the first ballot. Dewey, a moderate to liberal Republican, chose the conservative Bricker as his running mate. Dewey originally preferred fellow liberal California Governor Earl Warren, but agreed on Bricker to preserve party unity (Warren became Dewey's vice presidential candidate in the election of 1948). Bricker was nominated for vice president by acclamation. Results by county explicitly indicating the percentage for the winning candidate. Shades of blue are for Roosevelt (Democratic), shades of red are for Dewey (Republican), and shades of green are for "No Candidate" (Texas Regulars). The Republicans campaigned against the New Deal, seeking a smaller government and less-regulated economy as the end of the war seemed in sight. Nonetheless, Roosevelt's continuing popularity was the main theme of the campaign. To quiet rumors of his poor health, Roosevelt insisted on making a vigorous campaign swing in October and rode in an open car through city streets. A high point of the campaign occurred when Roosevelt, speaking to a meeting of labor union leaders, gave a speech carried on national radio in which he ridiculed Republican claims that his administration was corrupt and wasteful with tax money. He particularly derided a Republican claim that he had sent a US Navy warship to pick up his Scottish Terrier Fala in Alaska, noting that "Fala was furious" at such rumors. The speech was met with loud laughter and applause from the labor leaders. 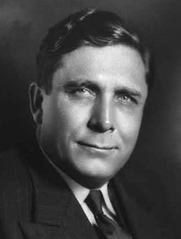 In response, Dewey gave a blistering partisan speech in Oklahoma City, Oklahoma, a few days later on national radio, in which he accused Roosevelt of being "indispensable" to corrupt big-city Democratic organizations and American Communists; he also referred to members of Roosevelt's cabinet as a "motley crew". However, American battlefield successes in Europe and the Pacific during the campaign, such as the liberation of Paris in August 1944 and the successful Battle of Leyte Gulf in the Philippines in October 1944, made Roosevelt unbeatable. Dewey did better against Roosevelt than any of Roosevelt's previous three Republican opponents: Roosevelt's percentage and margin of the total vote were both less than in 1940. Dewey also gained the personal satisfaction of finishing ahead of Roosevelt in his hometown of Hyde Park, New York, and ahead of Truman in his hometown of Independence, Missouri. [citation needed] Dewey would again become the Republican presidential nominee in 1948 and would again lose, though by a slightly smaller margin. Of the 3,095 counties/independent cities making returns, Roosevelt won in 1,751 (56.58%) while Dewey carried 1,343 (43.39%). The Texas Regular ticket carried one county (0.03%). In 1944, the constantly growing Southern protest against Roosevelt's leadership became clearest in Texas, where 135,553 votes were cast against Roosevelt but not for the Republican ticket. The Texas Regular ticket resulted from a split in the Democratic party in its two state conventions, May 23 and September 12, 1944. This ticket represented the Democratic element opposing the re-election of President Roosevelt, and called for the "restoration of states' rights which have been destroyed by the Communist New Deal" and "restoration of the supremacy of the white race". Its electors were uninstructed. As he had in 1940, Roosevelt won re-election with a lower percentage of both the electoral vote and the popular vote than he had received in the prior elections—the second of only three presidents in US history to do so, preceded by James Madison in 1812 and followed by Barack Obama in 2012. Andrew Jackson in 1832 and Grover Cleveland in 1892 had received more electoral votes but fewer popular votes, while Woodrow Wilson in 1916 had received more popular votes but fewer electoral votes. Source (Popular Vote): Leip, David. "1944 Presidential Election Results". Dave Leip's Atlas of U.S. Presidential Elections. Retrieved August 1, 2005. Source (Electoral Vote): "Electoral College Box Scores 1789–1996". National Archives and Records Administration. Retrieved August 1, 2005. The passing of the 22nd Amendment of the United States Constitution in 1951 renders this election the only occasion in United States history in which a candidate has been allowed to run for a fourth term as president. 1944 was, until 2016, the most recent election in which both major party candidates hailed from the same state, as Roosevelt and Dewey were from New York. The 2016 presidential election has now taken that honor as both major candidates in that election, Hillary Clinton and Donald Trump, coincidentally, also identified New York as their home state. Except Lyndon B. Johnson's landslide reelection in 1964, no post-1944 Democratic candidate has managed to equal or surpass Roosevelt's margin in popular or electoral votes in this election, which was the closest of all his four campaigns. The 1944 election was the last election in which any candidate received over ninety percent of the vote in any state (FDR won 94 percent of votes cast in Mississippi). The Democratic candidate did receive more than ninety percent of the vote in The District of Columbia in 2008, 2012 and 2016. The 1944 election was the first since Grover Cleveland's re-election in 1892 in which the bellwether state of Ohio backed a losing candidate. The 1944 presidential election was the last election in which the Democratic party candidate won every single state that constituted the Confederacy, as well as all 14 states of the South. 1944 is the last occasion the Democratic Party has carried Cache, Washington and Box Elder Counties in Utah, Indian River, Lake, Sarasota and Manatee Counties in Florida or Augusta and Orange Counties in Virginia. Hell-Bent for Election, an animated Roosevelt campaign film. ^ "Voter Turnout in Presidential Elections". The American Presidency Project. UC Santa Barbara. ^ "1944 Presidential General Election Data - National". Retrieved April 14, 2013.